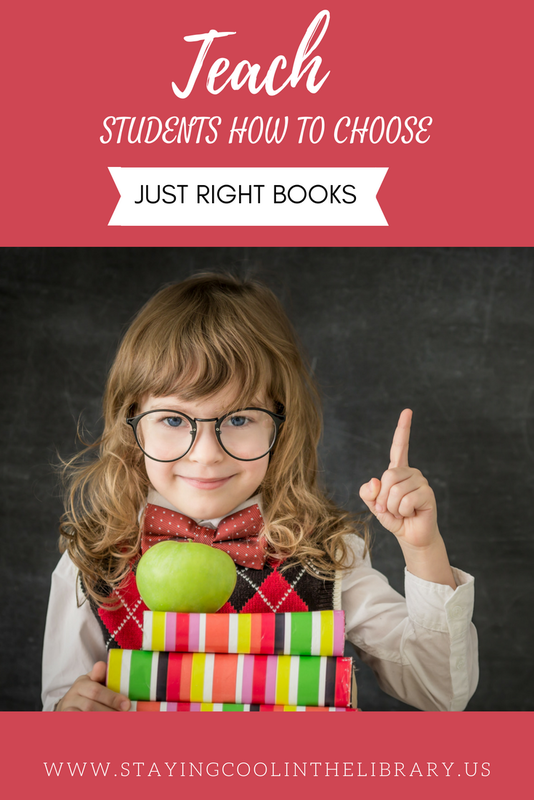 Choosing a book for independent reading is a challenge for many students. They struggle to find a book that they can and want to read. Classroom teachers go over this when they teach Reader's Workshop and the Daily 5, but it is also something I teach in the library. I discuss this concept with all grades throughout the school year. However, at the beginning of second grade is when I introduce the concept of using the 5 Finger Rule and teach a more in-depth lesson. First I begin by having a discussion with students about what the phrase "just right" means. I provide examples like picking out new clothes to wear. You do not want to pick a pair of pants that are too small and tight. You also don't want to choose a pair that is falling off and so long you step on them. You want a pair that fits just right. I then tell them that this is what we need to do when we are choosing a book to read. It needs to be a book that is the right "size" for them. Next, I read the book Goldi Socks and the Three Libearians by Jackie Mims Hopkins. I purchased this from Demco but it is also available on Amazon. 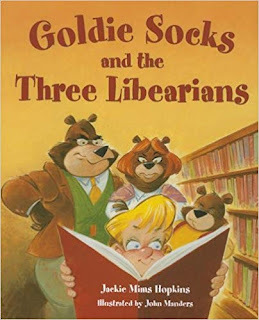 If you have never read this book before, it is a take-off of Goldilocks and the Three Bears. Goldi Socks is walking through the forest when she stumbles upon a house that looks like a book. She goes inside and finds all different kinds of books. She searches until she has a just right book. And when the libearians come home they are happy that she is there reading their books. After we read the book I show them a few different posters that I use as anchor charts. 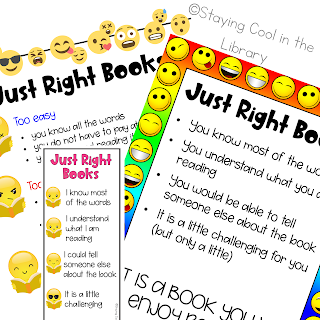 The first one reviews what a just right book is. 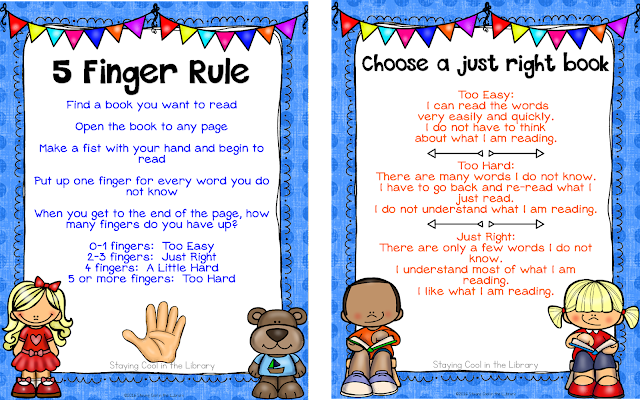 Then we talk about how to tell if it is too easy, too hard or just right and how to use the 5 finger rule. 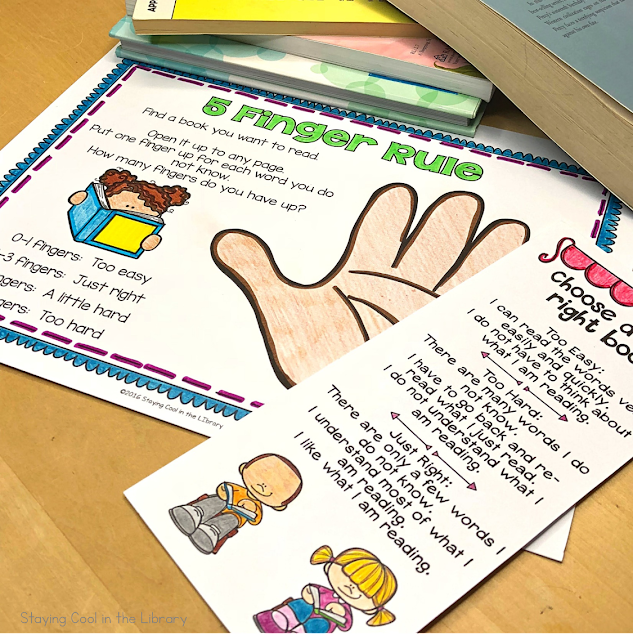 I always tell the kids that if they are putting up a finger for every word they do not know and they run out fingers and start using their toes, then the book is definitely too hard for them. Surprisingly they get a kick out of that and always laugh. Thankfully I haven't had a student yet take off their shoes and try it. By this point, the students are more than ready to check out their books. I usually tell them to choose one book that is just right and then another book that they think looks interesting. I have bookmarks to hand out to them and a coloring page as well. I will also give these out periodically throughout the year when I think they need a refresher. 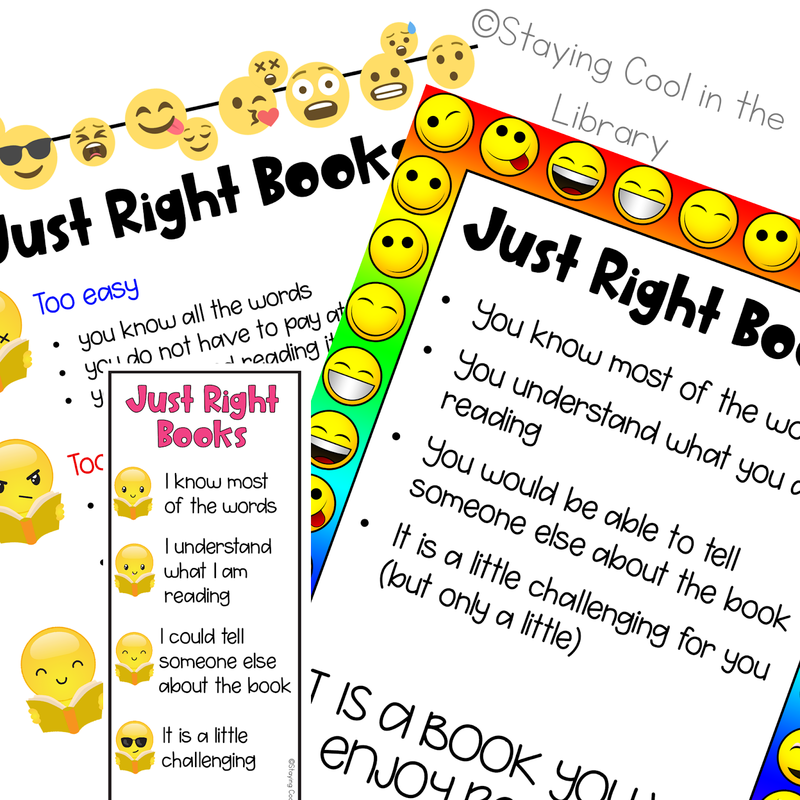 You can purchase my Just Right Books activities from my TpT store or my website. 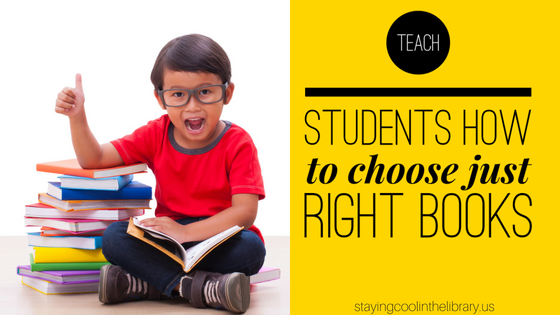 With 3rd, 4th and 5th graders I also take the time to review choosing just right books. I have found this to be even more important once my school stopped focusing on Accelerated Reader. I tell them they do not have to do the five finger rule (physically hold up a finger for every word they do not understand). But I do tell them to keep track in their head. I also like to show them what the process looks like by having them watch me choose a just right book. I will have three books ready ahead of time. I select one book that has a really interesting cover but is also at a higher reading level. I will select one book that is a simple chapter book and one that is in between. I will pick up the first book and say: "I love the cover on this book. There is a dragon on the cover and I love dragons." Then I will read the book blurb or summary of the book. Sometimes I will choose a random page from the book to read. You do not have to read anything out loud, you just want the students to observe you. Then say "I can't even understand the summary of this book. There are so many words I have never seen before. Even though I think I would like this book, it is too hard for me." Pick up the second book. Repeat the process but this time the book is too easy for you to read. Then go to the third book. This book will not only be interesting to you but is also one you can read. It is not so easy that you don't have to think about what you are reading. But it's not so hard that you struggle to read the words. I always make sure to emphasize the fact that in order for a book to be "just right" it has to be something they want to read. Having the ability to read the book is not enough. If they are not interested in the book than it is not right for them. I have very strong feelings on this subject - mostly stemming from the time when Accelerated Reader was used as a punishment and my students learned to hate reading. But that's a subject for another time. This idea I found in a librarian Facebook group (unfortunately I do not remember which one). It's called the shoe lesson. Ask students to remove their shoes. Then explain that they are going to go shopping for new shoes. Students will walk around looking at all the other shoes to "buy" a new pair (tell them they can not buy the shoes they just took off). While they do this, you will walk around helping students decide on what shoes are the best for them (making sure there are mistakes to help emphasize the point.) Then compare how finding the right shoes is like finding the right book. Each kid is different but they need a pair that they not only like but that fits them. 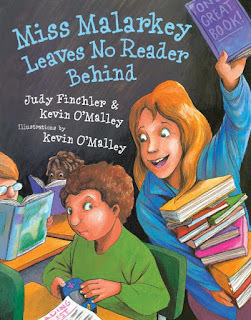 I also like to read the story Miss Malarkey Leaves No Reader Behind by Judy Finchler and Kevin O'Malley. It is about a boy who is unable to find a book that matches his interest and the teacher (Miss Malarkey) who refuses to give up until she finds the perfect book for him. I believe that many students are overwhelmed when choosing a book to read. Having too many choices is not always a good thing, especially when it comes to reluctant readers. Often I will pull books that I know will be appealing to the students but also readable. Then I put these books in a separate location for the students to choose from. This helps to build their confidence which we all know is vital in developing a love of reading in a child. Another option for older students is to hold a book tasting. A book tasting is a chance to expose students to different kinds of books. It is a way to expose students to different genres and to get them engaged and excited about reading. Read my book tasting blog post to learn more about how to incorporate one with your students. Because I thought that my Goldi Locks and the Libearians posters might not appeal to older students, I created a new set of posters and bookmarks. If you would like them you can download them for free from my resource library. If you are already a subscriber, click here and log-in with the secret password. If you are not an email subscriber yet, then click below to sign up. As soon as you confirm your subscription you will receive an email with instructions on how to access the resource library.